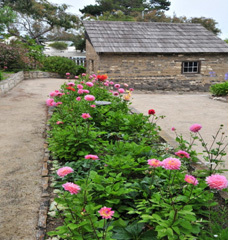 Monterey State Historic Park has six gardens that offer privacy for special events such as weddings and receptions. In addition, the Custom House Plaza, which overlooks the bay, is suitable for large receptions as well as cultural and family-oriented events. The plaza has a capacity of approximately 1,000 people. Located at 20 Custom House Plaza in Monterey, the Memory Garden is a wonderful venue for private and community functions such as weddings, receptions and banquets. The garden was designed by Frederick Law Olmstead, Jr. in 1927. It is enclosed by an eight-foot adobe wall and has three access gates, two of which are wheelchair accessible. 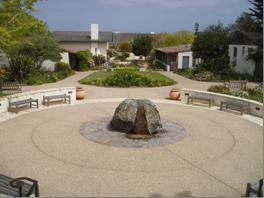 The Monterey State Historic Park office and the historic Pacific House Museum are part of the Memory Garden enclosure. A 15-foot diameter fountain is the central feature (photo at right) and Southern Magnolia trees provide shade. 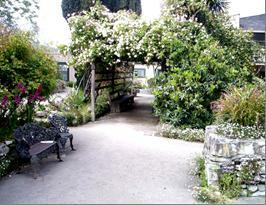 The venue includes a historic flower garden, an arbor, and a 5 x 16 foot barbecue that can be used for cooking. Use Periods: Daylight and evening hours year round, music until 9 p.m. Parking: State Parks does not provide parking. There is a parking garage nearby. Please note: In addition to the above rates there is a $150 processing fee and a refundable $1000 deposit. 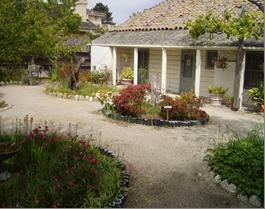 This garden, located behind the historic Stevenson House at 530 Houston Street in Monterey, is enclosed by an adobe wall and has three gates, two of which are wheelchair accessible. 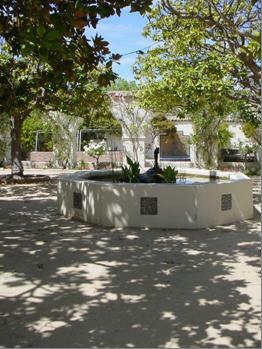 The garden includes pathways and benches as well as a small gathering space adjacent to the historic two-story adobe building which is named for the author Robert Louis Stevenson. The building, which has seen many uses, was a boarding house when Stevenson stayed here for a few months in the autumn of 1879 while courting his future wife, Fanny Osbourne. Parking: State Parks does not provide parking. There is limited street parking nearby and a parking garage two blocks away. Please note: In addition to the above rates there is a $150 processing fee and a refundable $500 deposit. Except as noted above, these gardens are enclosed and located behind the historic adobes. Same as Stevenson Garden (see above). Reservations may be made up to two years in advance of the event date. Once requested, a date will be tentatively held for 14 calendar days, and a non-refundable processing fee and refundable security deposit will be due within 14 days in order to officially hold the date. If the processing fee and security deposit are not received within 14 days, the event will be removed from the calendar. Once the processing fee is paid, State Parks will request additional materials in order to complete the special event permit. The requested date is not reserved until all paperwork has been received and a special event permit has been signed by the Sector Superintendent. Proof of liability insurance and compliance with California State Parks' terms and conditions is required for all events.